So, first the pitch — for your Black Friday shopping pleasure, here’s a couple of things that will help scratch that itch to play around with hardware. 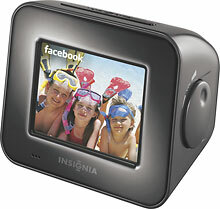 First of all, two chumby-powered devices under the Insignia brand in Best Buy are on sale for Black Friday. 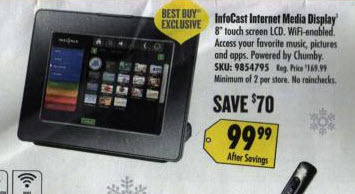 The original 8″ Infocast device — an 800 MHz linux PC with an 8″ SVGA LCD and touchscreen — is rumored to be on sale for as low as $99 in some stores, although Best Buy’s on-line price pegs it at $129. Either way, it’s a smashing deal for a linux PC. The other chumby-powered device is the 3.5″ Infocast, which you can think of as the Chumby One Internet Radio’s battery-less little brother. This, too, is on sale for Black Friday, and at just $79, it’s a steal. 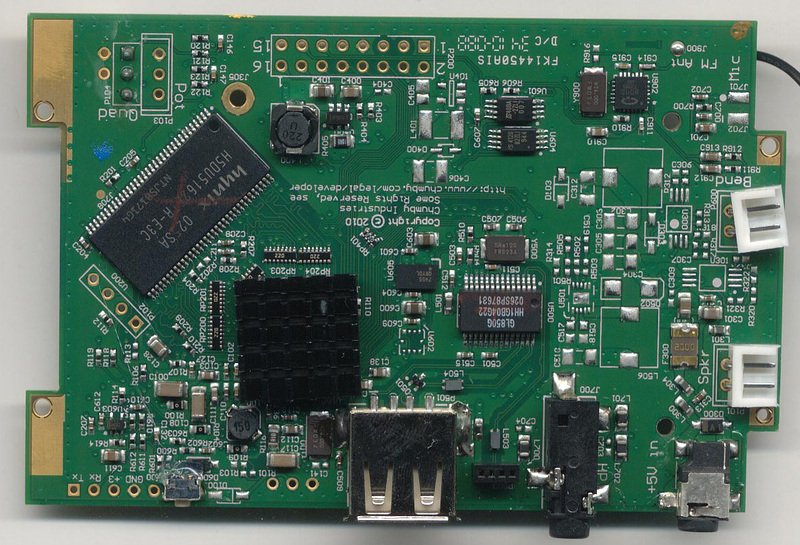 The motherboard for the 3.5″ Infocast is shown below, and if it looks familiar, you’d be right. One small improvement to the 3.5″ Infocast board is the addition of a “mod port” which breaks out several GPIOs, I2C, composite video, and a spare USB port to a 0.1″ pitch header (which is a subset of the pinout that’s featured in the chumby hacker board), shown below. sudo find me a Cake! So here’s where the Cake comes in. Somewhere on the motherboard of the Infocast 3.5″, I’ve hidden a cake — the cake is not a lie. The first person who can find the cake and post a photo of it within the next two months will be given a cash prize of US$300. Put in perspective, that’s two months’ wage for a Chinese factory worker (and that’s after the across-the-industry 20% raises that were effected by a string of suicides at Foxconn, where the iPhone is assembled). Given that the standard monthly prize for Name that Ware is just $10, this gives an idea of how hard I think it is to find the cake. But, I promise you — the cake is not a lie. And here’s where the Bitbake comes in. For those who have been wanting to build your own firmware for both the 8″ and 3.5″ chumby platforms, a simple solution finally exists. As announced on the chumby forum, there is now an easy to use Open Embedded configuration that will allow you to build and customize, from scratch, your very own firmware image. You can configure the firmware to be anything from a minimal console-only build, to one that includes a window system and web browser of your choosing. The build configuration is “complete” in the sense that the product of the OpenEmbedded build is a binary image that you can directly write to the microSD card and boot with no need for further massaging. This entry was posted on Tuesday, November 23rd, 2010 at 11:27 am and is filed under chumby, Hacking. You can follow any responses to this entry through the RSS 2.0 feed. Both comments and pings are currently closed. Have you look at using Linaro instead of Open Embedded? Linaro has a lot of vendor funded developer resources behind it right now. They are focusing on ARMv7 but they have been fixing bugs we’ve reported all the way down to ARMv4. I’ve always been concerned about the level of backing behind Open Embedded. Please please please… Anyone willing to buy one for me and ship it to europe? 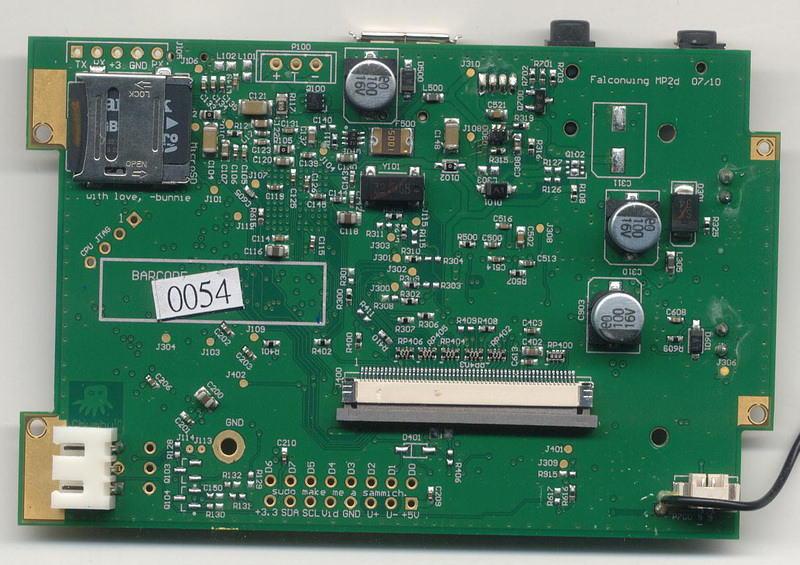 I would take a look inside the EEPROM, try and read it out and have a look. Damm, I can’t get hold of one! Having fun with the Infocast. I have a couple of Newbie questions. First, on the PCB, there are two RX’s labeled. I’ve connected TTL/RS-232 connectors a couple of times, and in those cases, it was pretty straightforward, as there were just TX, RX, 3V, and GND. I know this must be pretty basic. Hoping to learn something here… could you please let me know why there are two RX’s (and which one to use)? Second, I’ve been trying to get a webcam working with the device. I have a v4l1/2 compliant Logitech webcam, which I can make work with OpenCV and cheese on my Ubuntu dev machine. But I can’t seem to make it work on the Infocast device. I modprobe compat_ioctl32, v4l1_compat, and videodev. I then insmod uvcvideo. I see in dmesg that the webcam is recognized. I see a /dev/video0 device created. And I see a v4l sub-directory under /dev/. All looks pretty much the same as in my dev box. [ 69.196875] Silvermoon Touchscreen loaded successfully. I’ve downloaded the linux-2.6.28-silvermoon-1.0.3 kernel source and cross compiled it. I’ve updated the kernel image and built the uvcvideo .ko module. Been fooling with it for a few days, so figured I’d ask. I know we’ve gotten video cameras working over USB with the device before, but I wasn’t the one who did it. Try posting your question on the chumby forum, you may find luck there. check the LCD cable. it’s tricky to get it fully inserted and if it falls out you’ll get a completely white screen. Also, make sure the RF shield hasn’t shorted to any of the capacitors underneath it near the screen cable. If it does, you can damage the backlight bias generator which would result in the screen never working again. isn´t the cake supposed to be on the 3.5″ motherboard like the one on the pictures above? Would it be necessary to render the device non-working to find the cake? At that reward level, it would be a possibility? You don’t need to render the device non-functional to find and reveal the cake, if you knew exactly where it is. But it’s not exactly plainly visible. Is it possible to see the cake in the pictures? No, it’s not visible in the pictures. The cake’s not obvious under x-ray… I have a few shots taken by an machine that wasn’t meant for board inspection. Hope this helps the search! BTW, how many of these units were ordered? I was surprised to find my unit is #0000018x; the board inside is #12xx. Seems pretty low for a mass-market item! It’s under the Chumby logo! That’s it, you found it! Congrats. 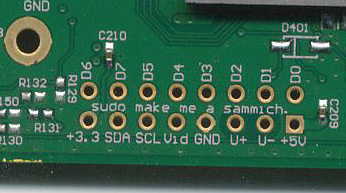 FTR it’s also possible to scrape off the chumby symbol to reveal the cake (without any damage to the PCB’s function). May I post a copy of that photo directly on my blog? Is the “mod port” only on the 3.5″ Infocast or is it also on the 8″ version? Also would the sensor package work with the Infocast? There’s a smaller version of the mod port on the 8″ infocast. 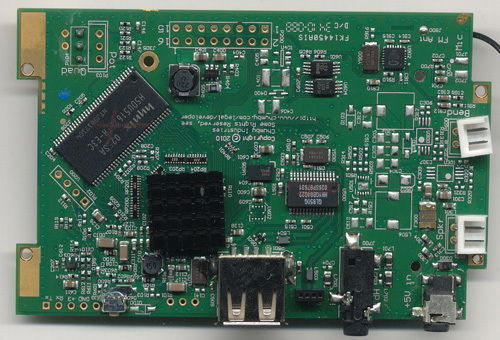 The sensor package–you’re referring to ones made for the chumby hacker board? No — chumby hacker board peripherals are generally not compatible with this one. Thanks for the reply. I meant the “sensor package” described on the Chumby developers hardware page. Are there schematics available for the Infocast 3.5″? Sales training for managers in sales and marketing is an investment for the creation of a sales team that is capable of consistent high performance results, while it is managed effectively and efficiently. though senior managers have a solid base of sales, sales skills and leadership qualities of confidence and complacency, blind individuals a great leader, with new strategies to boost performance. coaching in advance can maximize the effectivenessefficiency and potential of senior managers in sales and improve the performance of the sales management team. a rise in the performance of senior sales managers improve performance of sales management and sales employees. An investment in advanced coaching for senior sales managers in sales may be a major return on investment for your company. Sales coaching for managers in sales and selling is an investment for the creation of a sales team that is capable of consistent high performance results, whereas it’s managed effectively and efficiently. though senior managers have a solid base of sales, sales skills and leadership qualities of confidence and complacency, blind folks a great leader, with new strategies to improve performance. training before can maximize the effectivenessefficiency and potential of senior managers in sales and improve the performance of the sales management team. a rise in the performance of senior sales managers improve performance of sales management and sales staff. An investment in advanced training for senior sales managers in sales may be a big return on investment for your company.